As I travel around the world exploring exotic places and experiencing unique cultures, I often wonder why I haven’t yet reconnoitred my own land, the Godavari belt in Andhra Pradesh. As I travel around the world exploring exotic places and experiencing unique cultures, I often wonder why I haven’t yet reconnoitred my own land, the Godavari belt in Andhra Pradesh. Except for a few childhood vacations and a couple of visits as a curious adult, I never had an opportunity to know more about the culture that I was born into or the roots that shaped me. I set out to discover West Godavari (reserving the more gorgeous East Godavari for a later time) and ‘Palavelli Boutique Resorts’ came across as the perfect gateway to do so. Set in picturesque surroundings, it is not only an ideal weekend getaway to relax and rejuvenate but also a mirror to the local culture. After a blissful sleep in Narsapur Express (starts from Hyderabad, very conveniently after dinner), I woke up to a pretty scene: palm tree-lined emerald green paddy fields; the golden sun slowly turning into an orange ball, flocks of pristine white cranes in flight, and the water bodies feeding the crops reflecting all this glory! I got down at Palakollu station where the resort’s car picked me up. We passed through the dirty town strewn with plastic and clogged drains; steered through narrow lanes in small villages, which had an equal amount of plastic garbage. Through all this, the intermittent green carpets of paddy fields came as a great relief. In less than 30 minutes we reached the resort, where a delectable breakfast awaited me, hinting the presence of a competent chef on board. Situated amidst coconut plantations, the resort has a rustic charm: added to this are the ‘Earth Villas’ and the “Manduva” that remind you of times bygone. 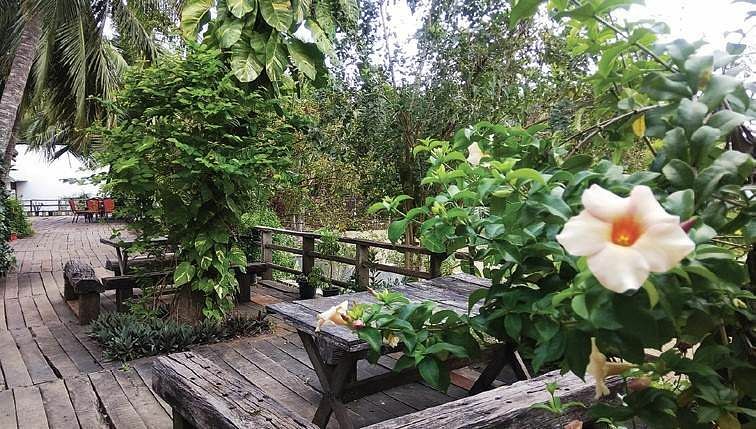 With ethnic décor and old world charm, the resort attracts many a visitor who is looking to connect with Nature and disconnect with the digital world. With no Wi-Fi and poor signals of 4G, the stay here certainly aids in digital detox. The soft breeze, the gentle rustle of coconut trees, and small birds in a symphony are all so soothing and “zen-like”, they calm the nerves and cleanse the soul. 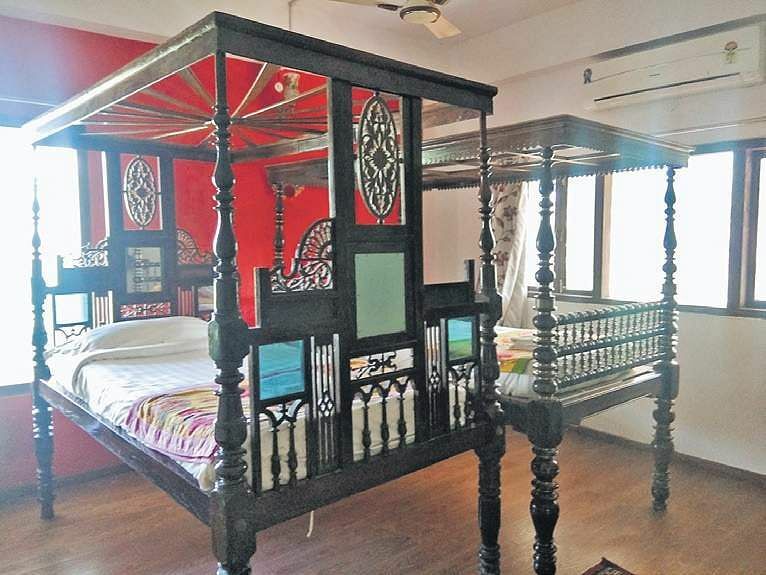 My spacious room opened to a colourfully decorated courtyard on one side. I would often sit by the huge glass window that offered pretty vistas. The defunct lotus pond has a quaint charm: wild and overgrown with weeds, it is home to water birds scouting for food. Three fibreglass cranes sit on its bank and stoically watch their living counterparts strut nonchalantly with a calculated gait and a keen eye for fish. Lesser creatures and frogs make ripples in the pond, distorting the reflected images of trees around. Palavelli is a popular choice for pre and post wedding shoots, a trending phenomenon. Young couples literally live their dreams through these reconstructed love stories. Spending small fortunes, they go for designer gowns (it may look grotesque on some, but never mind! ), make up artists, hairstylists in attendance and an event manager to coordinate the whole show. The photographer too realises his dream of “directing”: after many takes of the girl running towards the boy, swirling the skirt and landing in his arms, he okays the shot. The dream sequence is usually shot to a song, with as many costume changes as possible, like in the movies. The non-existent or yet to begin “romance” takes shape and blooms by the end of the day, by which time the tired ‘bride to be’ and a little hassled ‘groom to be’ walk hand in hand and melt into the Godavari horizon! Yes, the resort offers a good variety of locales including an infinity pool with infinite photo-ops, often challenging the creativity of the production team. I had whale of a time watching these shoots and interacting with the couples and the crew. What with drone cameras and high-end equipment, these shoots are quite high-tech and immensely entertaining. Not bad, our townsfolk have arrived on the fashion scene and are keeping up with the ‘filmy weddings’! Palavelli offers houseboat rides and arranges for parties on the river as well. 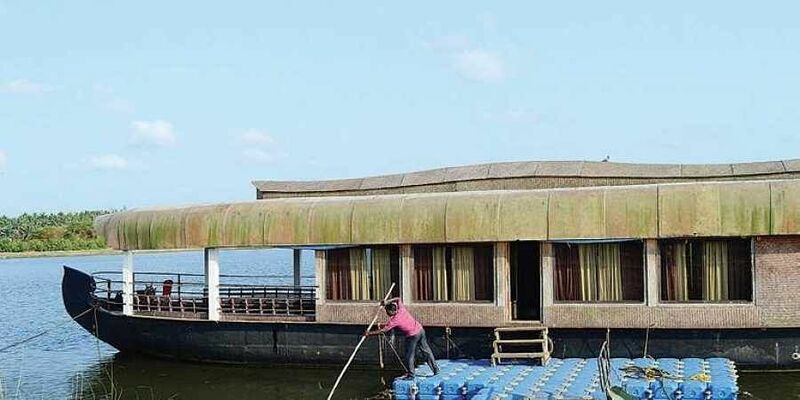 My ride on the Godavari was a most fulfilling experience – sitting in the houseboat, watching the uninhabited islands pass by, gliding over the mighty Godavari that is so majestic, so serene, so bounteous and yet so humble, I marvelled at this benevolence of Nature. I took solitary walks through the coconut groves to the riverfront and sat there watching an occasional fishing boat disappear into the sunset; passed hours watching monkeys frolicking on trees to the background score of crows in a chorus; listening to the silence of the green pond, I often fell asleep. I realised that it takes less than 58 hours to rewind and reset a fast paced life. How to reach: Overnight journey from Hyderabad-Palakollu railway station from the resort – less than 10 km.